Printed diffusers are a unique process capability directly arising from the Luximprint additive optics fabrication process. A novel feature whereby surface structures with a predefined ‘roughness’ are printed, eventually along with clear surface finishes, in one single process. This novel process feature – named ‘Frosted Finishes’ – greatly enhances the variety of products we 3D print for our users, as we can now add a next dimension to it: diffusivity. A quick and dirty photo demonstration including the performance of various frosted finishes applied onto a SMD LED panel. 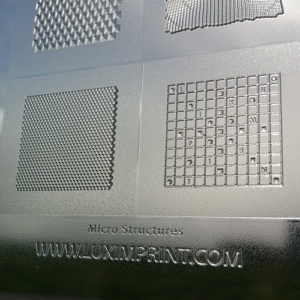 Combining printed micro-structure expertise with sheet- and thinfilm capabilities, we have defined a range of Frosted Finishes we can apply onto the various product types we print: Optical Plastics, Optographix, Textured Surfaces, 3D printed reflectors, mold tooling and finally: Printed Diffusers. When preparing our users’ CAD files for 3D printing, we can either define a ‘smooth’ surface finish for optimal smoothness, clarity and performance or, on the contrary, apply a ‘frosted finish’ onto the surface. This actually results in an undefined or defined scattering of light aiming for better light control, reflectivity, source hiding, efficiency and finally also aesthetics. And thus, our new product group ‘Printed Diffusers’ was born. Depending on what definition of roughness is choosen, light rays get ‘broken’ and start to move into all possible directions, rather than being directed to a certain target specifically. As such, the structure may create elliptical, (a)symmetric beams or serve RGB-W color mixing purposes. Some practical examples of applied functional frosted finishes are 3D printed reflectors, diffusers and light guiding plates for applications in general lighting, automotive lighting or retail lighting. Allthough they might be close in properties, functional lens sheets differ from printed lens diffusers in feature size and function. 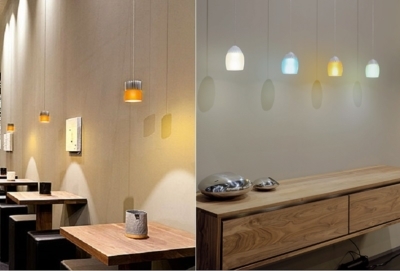 From an aesthetic point of view, on the contrary, diffusers may include sheets or thin-films that are intended for use in decorative applications. As such, the finish does not have a direct function, the structure absorbs the light and emits it into undefined directions, or illuminates a certain predefined area. Optical micrographics, company logos and patterned structures can easily be integrated when printing diffuser sheets. Where ‘custom’ in most cases may refer to the fact we can tailor our optical plastics to our users’ needs from a functional perspective, another interesting feature arises here: customized diffusers. From our process, customizing diffusor sheets with e.g. a company logo’s, text, pattern, symbols and other features is very well possible. Some interesting features are shown below, in fact, the possibilities are endless! At Luximprint, we do not run large volumes of printed diffuser sheets, but stack to enabling the upfront design and engineering by providing functional test samples to our users in a fast, flexible and cost-effective ways, in lane with our overall service offering. Those masterpieces are generally used for validation of new concepts and design simulations. For those firms that want to create their custom diffuser optics or need small project volumes, we aim to be the preferred prototyping partner. In case of further questions, remarks or project queries, please contact us! 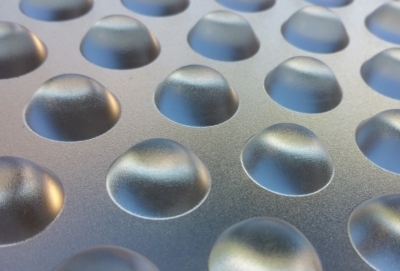 Frosted finishes can be applied in one single process onto functional optics and lens arrays to generate straylight or avoid blinding. The correlation between the units of measure used to define frosted surface finishes and how they compare to for example mold roughness, is a commonly raised question in our user group. Here in Europe, we are accustomed to the standard of measurement for defining mold surfaces, such as Roughness Average (RA) and Root Mean Square (RMS), but elsewhere (such as in the US) they might be used to the definitions as set forth by the Society of the Plastics Industry (SPI). Fortunately, the science behind frosted finishes can be left to a qualified engineer who can help achieve the surface finish that best matches his customer requirements or the mold tool to be ordered. Soon, we will officially launch our ‘Frosted Finishes’ capabilities including the specific measurement values. Stay tuned!